SAINT AUGUSTINE – Dr. Steve Noll will present “Ditch of Dreams: The Cross Florida Barge Canal & The Struggle for Florida’s Future” Sept. 13 at 7 p.m. at the St. Augustine Lighthouse & Maritime Museum. The event is free and open to the public. Due to historic nature of the event space, special arrangements have been made for people with disabilities and those with special needs. Those needing special accommodations are asked to call Allyson Ropp at 904-829-0745, ext. 247 or email Allyson at aropp@staugustinelighthouse.org. 16: Dr. Michael Francis – Before Jamestown: Europeans, Africans and Indians in La Florida, 1513-1607 **This program begins at 6 p.m. The St. Augustine Lighthouse & Maritime Museum will participate in Smithsonian Magazine Museum Day on Saturday, Sept. 22. Guests must present a printed ticket in order to gain free entry. Tickets will be available for the public to download beginning at midnight on August 15, 2018. Registration is available at www.smithsonianmag.com/museumday. Museum Day is an annual celebration of boundless curiosity hosted by Smithsonian Magazine. Participating museums and cultural institutions across the country provide free entry to anyone presenting a Museum Day ticket. The Museum Day ticket provides free admission for two people on Saturday, Sept.22. 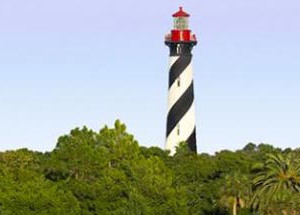 Hours are 9 a.m. to 6 p.m. at the St. Augustine Lighthouse & Maritime Museum.